The Warwick BC80 - 80 Watt Bass Combo Amp features Class-An amplifiers. This type of amp is typically more linear and, as such, is less complex than other amplifier classes. The amplifying element is biased so the device is always conducting to some extent. This means the amplifier is always on, avoiding the problem of crossover distortion associated with class-AB and -B designs The Warwick BC80 - 80 Watt Bass Combo Amp features Low-Z CIRCUITRY. By lowering the impedance inside an electronic circuit you lower the amount of thermal noise. In an amp where you have tone controls that lift mids and highs a considerable amount, proper impedance level makes the difference between enduring audible annoying hiss, and enjoying a pleasant tonal experience. 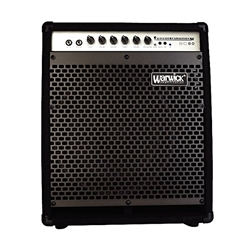 The Warwick BC80 - 80 Watt Bass Combo Amp features DYNAMIC DISTORTION LIMITER . Distortion occurs when an amplifier works beyond its range, when the power supply cannot supply the power any more to take the amp higher. A common method to control distortion in amps is to use a limiter, a device that stops the signal going beyond a specific level. Audio limiters work by setting a threshold signal level where the circuit kicks in and keeps signal levels within the capabilities of the power supply. This method is not very precise and often causes audible effects such as pumping and thumps. We designed a circuit that instead reads the distortion level in the power amp and starts limiting as soon as the amp shows even miniscule amounts of distortion. This means our amps always stay within 0.3% distortion (THD) when most amps are rated at between 5-10% distortion (that means that to get your 20 Watt out of a 20 Watt amp you will get it audibly distorted and if you want a clean signal the power will be a lot less).